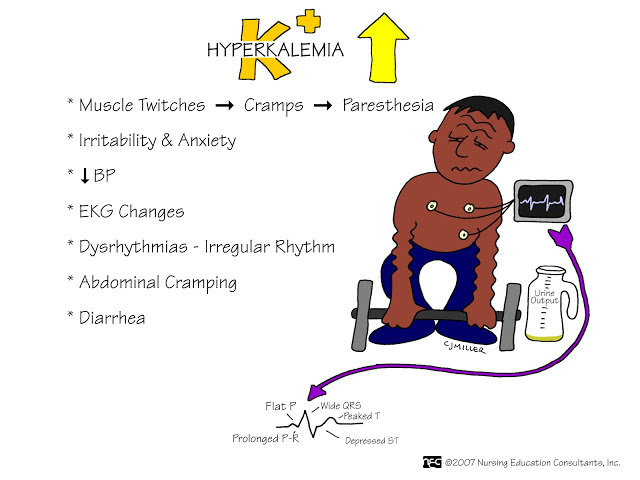 Hyperkalemia is an elevation of the level of potassium in the blood above 5.0 mmol/l. The first presentation of hyperkalemia is cardiac arrest with a potential of fatal arrhythmias. 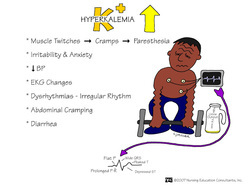 Hyperkalemia is presented with areflexia, paraesthesia, weakness, abdominal apin, palpitation, mild dyspnea ( due to metabolic acidosis) and hyperpigmentation from Addison’s disease association. 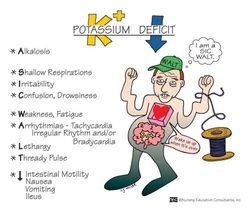 The causes of hyperkalemia are Addison’s disease or adrenal insufficiency, tissue necrosis from ischemia or burn, rhabdomyolysis from crash injuries, metabolic acidosis, hemolysis, drugs such as pentamidine, trimethoprim, calcineurin inhibitors ( tacrolimus, ciclosporin ) for immunosuppression , spironolactone, amiloride ( potassium sparing diuretics), angiotension receptor blockers, ACE inhibitors ( drugs affecting urinary excretion ) and NSAIDS ( naproxen and ibuprofen). Other causes of hyperkalemia are massive blood transfusion, hemolysis, renal failure and excessive and rapid administration of potassium. Investigations require are full blood count ( to exclude any hemolysis), urea and electrolytes ( to detect if potassium level is more than 5 mmol/l and to detect any chronic renal failure . Higher potassium level is well tolerated with chronic renal failure), blood glucose ( diabetic ketoacidosis), blood gases ( detect the present of metabolic acidosis), ECG ( may reveal wide QRS complexes, prolonged PR interval, flat P waves and tall T waves ), plasma cortisol ( reduction in plasma cortisol due to Addison’s disease or adrenal insufficiency and creatine kinase which is elevated in crush injuries. Hypokalemia is a reduction in potassium level in blood less than 3. 5 mmol/l. The symptoms and signs of hypokalemia are cardiac arrhythmias ( worse/serious arrhythmias that lead to sudden death due to low level of potassium), paralytic ileus ( always check serum potassium in prolonged ileus patient post- operatively ), constipation , myalgia and muscle weakness. Hypokalemia may be due to excessive loss of potassium due to endocrine causes such as hyperaldosteronism /Conn’s syndrome ( patient complains of unexplained lethargy, muscle weakness and fatigue), steroid treatment and Cushing’s syndrome, gastrointestinal causes such as laxatives intake, fistula, villous adenoma, vomiting and diarrhea, and renal causes due to renal tubular disease and diuretics. Hypokalemia is also associated with inadequate loss due to reduce oral intake as a result of dysphagia or coma and potassium free intravenous fluid. The investigations require are ECG ( prolonged QT intervals, the present of U waves, ST depressions and flattened T waves), blood bases ( increase in pH and bicarbonates that indicates metabolic alkalosis), blood glucose ( to rule out diabetic ketoacidosis ), urea and electrolytes ( to measures serum potassium level if less than 3.5 mmol/l, ) serum magnesium ( in hypokalemia, magnesium level is low. Magnesium is usually require for adequate processing of potassium), ACTH level ( high ACTH level in pituitary dependent cases /very high ACTH level with ectopic ACTH secretion and low ACTH level with adrenal tumor ( may be undetectable), urinary free cortisol ( rise in Cushing’s syndrome ), plasma aldosterone ( rise in Conn’s syndrome), plasma cortisol ( loss of diurnal variation in Conn’s syndrome and plasma aldosterone ( high in Conn’s syndrome).